For technical support on all Oakley projects please now refer to the knowledgeable and helpful Oakley Sound Forum which is hosted at Muffwiggler.com. Tony Allgood and Paul Darlow do not provide building support for Oakley projects, but both are usually available for help via the forum. What is the difference between Oakley Sound Systems and Krisp1? Oakley Sound Systems is a small company specialising in the design and modification of analogue music synthesisers. Oakley Sound sell printed circuit boards (PCBs) and some electronic parts to enable people to build their own electronic music projects. This website is run by Oakley Sound Systems. Krisp1 is a separate company selling pre-assembled Oakley modules. Krisp1 is run by Paul Darlow and his website is here. If you would like to purchase any parts sold by Oakley Sound then you can do so via our ordering page. Do you do ready made units? Official ready built modules in MOTM, K1 and MU (Moog Unit) formats are available from Paul Darlow at Krisp1. See here for contact details or visit the ordering page. Do you sell whole kits? Neither Oakley Sound or Krisp1 are planning to sell full DIY kits. However, many component kits are on offer at Elby Designs in Australia. Do you supply ready made cases? Paul at Krisp1 doesn't sell cases individually but he is able to supply complete Oakley modular systems which include a case and power supply. However, if you need your own case, Flightcase Warehouse in the UK can supply 19" rack (ie. 10U wide) flightcases for a very good price. We also recommend their custom service if you need a shallower case or backless case. For studio work you should also consider All Metal Parts as they have a good range of flat pack 5U and 6U metal cases with rack rails to the front and rear of the case. To mount standard Oakley modules into a 19" rack you will need a pair of either Krisp1's 5U mounting rails, or SynthCube's MOTM 19A rack mounting rails, for every 5U of height. A 6U high 250mm deep flightcase sleeve made from lightweight astroboard with aluminium trims. Front and rear rack strips are fitted to allow modules to be mounted on the front and a power supply panel to the rear. Everyone will have their own preferences so its difficult to recommend specific modules for a complete system. However, visit the Which Modules page for my quick 'getting you started' advice. Where do you get your front panels? Either at Schaeffer in Germany or Frontpanel Express in the US. Alternatively, you can obtain excellent 5U MOTM style panels from Synthcube in the US. Can I buy the Schaeffer front panels direct from Oakley Sound or Krisp1? No. These need to be ordered from Schaeffer in Germany or Front Panel Express in the US. Both companies offer an excellent service. The Frontplatten Designer software is a free download and features secure online ordering too. See the Schaeffer or Frontpanel Express websites for more information. The sales representative at Schaeffer speaks very good English if you do need to contact them direct. Can I buy schematics/PCB artwork for the modules? No, we do not sell any schematics for any of our currently sold modules or PCBs. Relevant schematics are only provided for purchasers of the project PCB. Purchasers of ready made modules can also request the relevant schematics if they wish to have them. Schematics for all legacy Oakley projects are available from Oakley Sound as pdf files for a small fee. 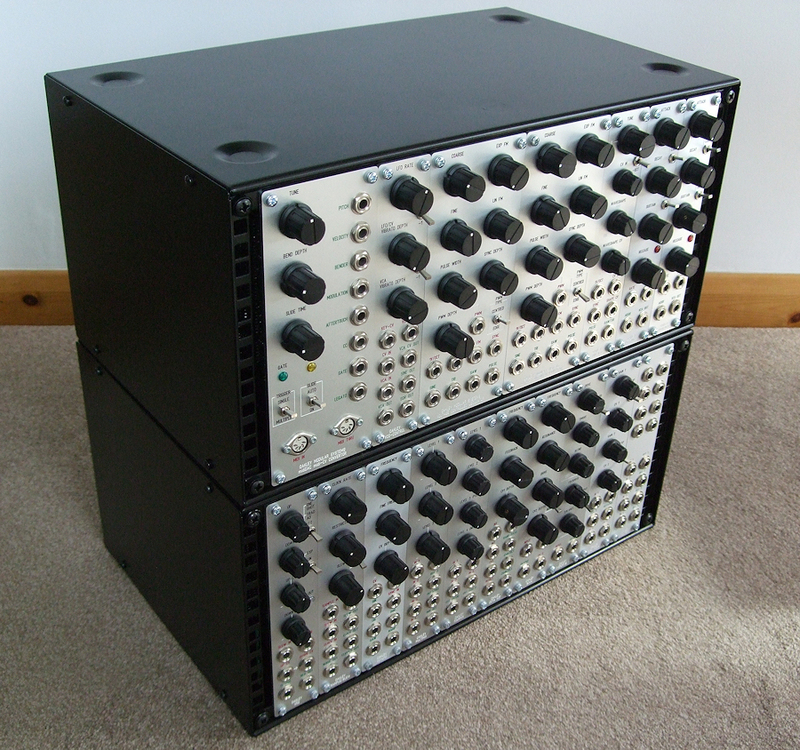 The cost is 2GBP per modular project, and 5GBP for any of the older rack projects. PCB artwork is no longer available for any of our products old or new. This one is tricky to answer. It all depends on your ability. If you can solder reasonably well, and have the patience to read through all the user documentation, you should be able to manage. However, if you rush and find your project doesn't work, that's when you are going to need more electronic knowledge. Being able to read a circuit diagram is an obvious advantage. If you want to get started, perhaps, a good way is to start on something simple. The smaller modules like the Little-Lag and MultiMix are very simple, and easy to test. My Oakley DIY project doesn't work, what then? Join the Oakley Sound Forum which is hosted at Muffwiggler.com. Then after checking that your question hasn't been answered you can post to the list for advice. Both Paul and Tony, and many other builders of Oakley equipment, are present on the forum and should be able to help. Please do not contact either Paul Darlow or Tony Allgood directly regarding building problems or generalised parts enquiries. Neither of us are able to help on an individual basis due to lack of time. All enquiries for help should come through the Oakley Sound Forum. If you still can't get the completed and undamaged module going, you can send it back to Oakley Sound to fix. You will have to pay for postage both ways, any parts required and Tony's time at 25GBP per hour. Please contact Tony Allgood to organise your personalised 'Get you working' service. All boards are RoHS compliant, which means they do not contain lead. All boards can be soldered with either lead free solder or lead based solder. All of my current boards can be soldered with either lead free or old fashioned leaded solder. I still prefer to use Pb/Sn solder for my own projects because it is easier to work with. Who are Oakley Sound Systems? This is a small company set up by Tony Allgood and you can found out about me here. This is a small company set up by Paul Darlow in 2007 to supply ready made Oakley modules. The usual electronic hobbyist stuff. The TM3030, S-VCO and VCO project, will be the hardest to make, as they require precise setting up. A scope or a chromatic tuner will be very useful, but they are not essential. Can I build these modules to sell to friends? How much will the whole project cost me? This depends on the case you have chosen to house your project. The case, knobs, pots and sockets are the most expensive items. Why do you think we rarely see synths with knobs on these days? The quality of these things will set the price of the project. For Oakley modules, I generally reckon around 40 to 140GBP per module including the Schaeffer front panel. The 5U VCO is probably the most expensive module and a single Little-LFO being the cheapest. It is the currency of the United Kingdom. GBP is a short hand way of writing 'Great Britain Pound'. This is the accepted way of writing our currency by the International Standards Organisation when you can't use the ordinary 'curly L' pound sign. Paypal and the webpages on this site use GBP. It should be noted that UKP, although more correct in terms of the countries that it represents, should not be used. GBP is called 'pounds sterling' on the money markets. It is not affiliated to the Euro in any way. 100 pence make 1GBP. So 6.50GBP is six pounds and fifty pence. Where on Earth is the United Kingdom? Not quite a FAQ, but I have had it asked a few times now. The UK is currently England, Scotland, Wales and Northern Ireland. Great Britain is just England, Scotland and Wales. The UK lies north of France in Europe, but is not connected to mainland Europe. A narrow stretch of sea called the English Channel separates us from France. Tony Allgood lives in rural Cumbria, England, 20 miles from the Scottish border, and close to the Lake District. The Lake District was home to many famous people such as Coleridge, Wordsworth, Beatrix Potter and Ruskin. Paul Darlow lives in Yorkshire, England. Yorkshire is a huge county which covers the original industrial heartland of England as well as the rolling moors of the Bronte sisters and the James Herriot stories. What standards do you use for controlling your modules? VCOs are 1V/octave. Gates are positive voltages above 2.5V. Audio and CV signals are typically +/-5V although can rise to +/-12V. What power supplies do I need? For more information about buying or building a suitable power supply for a modular system, please see the Powering Your Modular webpage on this site. The TM3030 needs a 15V AC or 24V DC wall wart. The Filtrex needs a 15V AC wall wart. Be sure to check the user documentation before buying a power supply. Can I make my TM3030 (or other rack project) internally mains powered? If you have the skills to do this you probably wouldn't be asking the question. Only fit an internal mains supply if you know what you doing. We cannot endorse this method of powering any Oakley product. Where do I get all the other parts for the project? In the UK: Rapid Electronics, CPC, RS-Components and Farnell. In the US: Mouser, Newark and Digikey. Small Bear and Futurelec are also useful. Parts codes for most of the common parts used in Oakley projects can be found in our lengthy parts guide which is found here. This is a PDF document which also contains Rapid and Farnell order codes that you may find useful. Due to limited time we are not able to answer this question for every part you need to buy. Our Builder's Guides and Parts Guide should give you sufficient information for you to purchase all the parts from your own suppliers without too much difficulty. You will also find that the Oakley Sound Forum will be very helpful too if you do get stuck. For UK buyers, Rapid and Farnell part codes for most of the common devices used in Oakley projects can be found in the Parts Guide. What is the form factor of those Alpha or ALPS pots you use? These are the very common 16mm format that is preferred by many modular and synthesiser manufacturers. There is 0.2" between pins in one gang and gangs are separated by 0.2". There are two gangs in a stereo pot and one gang in a normal mono pot. Shaft length varies with supplier but it may be cut down with a hacksaw or Dremel. Shaft diameter is typically 6mm and you can buy them in either slotted knurled shafts for push fit knobs, or smooth round shafts for screw fit knobs. 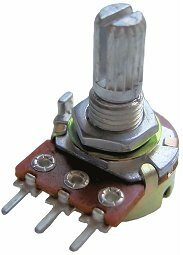 The picture shown below shows a short knurled shaft. Do I get a paper receipt with my order? No, all order documentation is sent by plain text e-mail only. These contain all the details of the order and you can print these off for your own records. All customers are given their own individual customer order number, and we keep a full record of all transactions. Last revised: June 25, 2016.